There are a tremendous amount of opportunities for a mobile wash operator at a gas station. 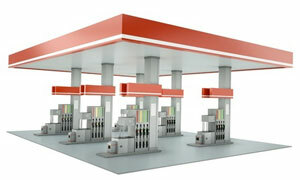 Many stations also include a small convenience store. The opportunities include the washing of the canopy, pumps, concrete pad, building, sidewalks, signs, and sometimes an exhaust fan and hood. Almost anything you see can be washed. Station owners want to have a clean, attractive place of business. They want to look good and attract customers. Some mobile washers have even been able to sign up whole chains of stations and servicing them has become their entire business. When approaching a job like this, take a minute to look around before approaching the owner. List all the cleaning possibilities you see. Many of your customers will be surprised at how much a mobile wash company can offer them. Many convenience stores either have washable siding, brick or stone. All of these surfaces can be washed with Limonene, Prodigy, or Citra-Solv. Downstream inject the product onto the surface and then pressure wash it off. Most of these storefronts have large windows. After washing the windows it’s a good idea to squeegee them off to avoid spotting. Be careful when washing at the doorway not to push water inside through the seam between the doors. If you do get water inside, immediately wipe it up with a towel before anyone can slip and fall. If your working around customers, arrange for someone to hold them back when you are washing at the entrance. Some people would love to sue you if you got them wet. When washing the building run you water temperature at around 110 degrees. A fact of life when washing canopies is that some clean easily and some don’t. Various environmental conditions, finishes, as well as how and when they have been washed before contribute to the degree of difficulty. You really can’t tell if the job is going to be easy or difficult until you start. If the canopy is an easy one, you will be able to downstream inject Mr. Muscle or Citra-Solv onto the surface, and then pressure wash it off along with all the pollutants. When your dealing with overhead washing, remember the apply back / wash forward method. Apply detergent at low pressure as you back away from the area of application, and then pressure wash forward pushing the chemical and pollutants ahead of you. Using an extension gun makes this job much easier than trying to work from a ladder. If you find out that you are working on a difficult canopy, various other cleaning methods will need to be used. you won’t get it on your skin or in your eyes when it drips. Most canopies are rugged units that are unaffected by pressure washing, but use caution around light fixtures and keep an eye on any panels that appear to be loose. Working with a water temperature of about 110 degrees generally works best for canopies. Examine the pad to determine how dirty it is. Look at the area where the cars drip the most oil. If this area is built up on the surface use a rotary nozzle and rip the build up down to the surface of the concrete. This step can be accomplished very quickly and will make a big difference to the end result. The next step is to direct spray a 50/50 mix of Power Stroke onto the heavily soiled sections where the most oil has dripped. After that down stream inject Power Stroke onto all the surrounding areas of the pad. Blend the down streamed solution into the edges of the stronger solution that was applied to the oil spots. Set your pressure washer thermostat to about 150 degrees. A dwell time of about five minutes should be allowed at the oil spot sections. Pressure wash the chemical and emulsified oil off the pad. To reduce your cleaning time and to look professional, use a surface cleaner. Please understand that concrete is very porous and oil spots that have been absorbed down into the concrete will leave a discolored shadow. Discussion of this fact with your customer prior to washing is advised. It can save a lot of problems later on. Oil spot shadows are one of those things that everyone wants a quick fix for. Chemical manufacturers make some wild claims about their products trying to fill the need in the market place. Be advised that to date there is no miracle product available. Concrete experts say that speedy dry or cat litter can be soaked with tar remover and applied over the stain about ½” thick, then dry speedy dry or cat litter can be placed over that about one inch thick. After a few days, remove it and pressure wash again. They claim this helps fade the shadow, but not many mobile washers find this procedure practical. Another additional step after cleaning the pad to make it look better is to apply Rust -Away. This product will whiten the concrete significantly. The product works most effectively in warm weather. The longer the dwell time allowed the whiter the surface will become. Another thing to keep in mind when washing the concrete pad is the surrounding surfaces. Most the time the pad will be surrounded by asphalt. This asphalt can be stained by the runoff created when washing the pad. Keep the asphalt wet and rinse it thoroughly when the pad is completed. To really make a huge difference after cleaning, a concrete sealer can be applied to the pad. Some convenience stores are set up with an exhaust fan system. If you are going to clean the system refer to the restaurant exhaust cleaning instructions for more information. The best advise about washing pumps is to stay low impact. Don’t even think about pressure washing a pump above the base. Whatever style pump you encounter, the top half has too many areas that can be damaged. Pressure wash the base only, work with a water temperature of about 120 degrees. Fortunately the base is generally what gets the fuel spilled on it. Mr. Muscle or Power Stroke will work well for this application. Clean the upper section of the pump with a damp towel that has a 1 to 30 mix of Mr. Muscle on it and then immediately wipe with a damp clean towel. After that any glass and chrome surfaces should be cleaned with glass cleaner. Down stream Power Stroke onto the sidewalk and pressure wash off. To reduce your cleaning time and to look professional, use a surface cleaner. Next begin the more time consuming task of gum removal. This should be done with a Roto-Max or other tight turning rotary nozzle on a single lance that is either 36 or 48″. Depending on you height, find the most comfortable length to work with. Wash the sidewalk with 120 degree water. When stripping gum some people like to run hot water and some like to run cold. Try it both ways and decide you own preference. Dumpsters and the area around them may need cleaning. If the dumpster in visable it should look clean on the outside. If it is on a concrete pad the pad should also be clean. If cooking is done at the location the dumpster and pad may be greasy. Use Power Stroke to degrease both the dumpster and the concrete pad.